In addition all the other usual resources, special thanks to the wonderful Directory of Early Michigan Photographers by David V. Tinder (2013) made available for free online through the William L. Clements Library at the University of Michigan. For background information about the Peter Palmquist database at the Beinecke Library at Yale, refer back to Episode 09. In today’s episode, the hunt for information about an early women photographer also leads to arenewed appreciation for Peter Palmquist’s prowess as a researcher of early women photographers. In today’s episode I’m going to take you on a journey of discovery, as we make a visit to an antique store — well, a virtual visit — to look for examples of photos by early women artisan photographers. Now as we go into the store, our hunt begins as we look around to find some piles of photos. They typically are either stacked in a box … or maybe in a basket … maybe sitting on a table or bookshelf or even in something under the table, pushed up against a wall. So we have to look around to see if the store actually even has any old photographs. We root around the store, and we locate a box and – a ha! It has a pile of photographs in it. So, first we’re going to need to sort through them. We carefully sift through the photos. We’ve got one goal: to find photos that have photographers names on them. We’re looking for the photographer’s name and the location of the studio where it was taken; both of those things are going to be really key to identifying the photographer ultimately. Sometimes, of course, as I’ve mentioned on other episodes, it’s easy to see if the photographer was a woman are not, e.g. if it’s says “Mrs” or “Misses” or “Miss” so and so. But more often, it’s not actually obvious when you look at a photograph whether or not it was taken by a woman. So you have to do some digging to figure out who the photographer really was when you see the name. OK, but we need to start with the name of photographer. So we look at that box of photos and … we’ve found one! The photographer’s name on the front of this one is Wixson, “W I X S O N”, and the studio was in Escanaba, Michigan. Alright, so we’ve got one to look for. But now the real fun begins – because now we’re officially on the hunt! We start with that name on the card — the cabinet card photo, that is — to see whether or not it was a woman photographer who’s responsible for that photo. Now, to do this investigation right at the antique store, we’re going to whip out our cell phone to check “Palmquist in our pocket”, also known as the “pocket Palmquist”. Well, that’s what my husband, Chris, and I call it. It’s the information from Peter Palmquist’s database that we’re using with permission from the Yale Beinecke library, where the database resides. I think I may have mentioned in a previous episode that my husband, Chris, actually made our pocket Palmquist database accessible from our iPhones, when we downloaded the information from the database and combined it with the list that we have of the thousand or so early women photographers that Chris and I have actually done some research on. But Peter Palmquist’s incredible list has nearly twenty thousand U.S. women photographers listed, and so we have all of that at our fingertips when we’re standing in the antique store looking at the Wixson studio [cabinet card]from Escanaba Michigan, to see if the Wixson studio could have been run by a woman. OK, so, we tap Wixson — “W I X S O N” — into the Palmquist database on our cellphones. And … we have a match:Mrs Julia E. Wixson in Michigan is actually listed in our pocket Palmquist. Peter Palmquist must have run across Mrs. Wixson somewhere in his research! Actually, though, there’s no town listed in the Palmquist database for Mrs Wixson. And, of course, the information that Peter Palmquist found is not digitized, so it’s all back at the Yale Beinecke library, in the boxes and boxes of information that Peter Palmquist collected. [See episode 09]. But that’s okay; it’s a really unique name, both the name Wixson and that the fact that the cabinet card comes from Escanaba, Michigan. So the likelihood of us being able to find more information about this particular photographer’s studio seems likely; i.e. we might really have a good chance at doing it when we get back home. Now we found the match [Wixson] in the Peter Palmquist database, but Chris and I are always mindful that we might be running into what we affectionately referred to as a “Palmquist Ploy”. You see, Peter Palmquist’s incredible list includes those twenty thousand US women photographers, but his list actually covers a broader range than the Photographs, Pistols & Parasols project. The Photographs, Pistols & Parasols project, of course, cuts off with women who were professional photographers only up until 1930, where as Peter Palmquist was more broadly interested in women photographers from any age; he died in 2003, and his database covers women [who were active] right up until when he died. So, sometimes Chris and I can get caught, buying a card thinking it might be from one of our early women photographers, when in fact it’s just a name that happens to be the same, but is really a woman who lived later in the 20th century. We’re looking at the Wixson card right now: Wixson – seems unusual; Escanaba, Michigan – seems unusual. Yes, we’re going to buy this [photo] and head home and do more research. So back home, we first check ancestry.com and newspapers.com. Particularly ancestry.com; you can search the US census records with both the name and the occupation. So, we’re going to look for “Julia E. Wixson”, “photographer” see if we get any hits. And… we don’t get any hits. OK, we’re not out of options yet. Escanaba, Michigan happens to have some of its directories available online, also available through ancestry.com. So let’s see what we’ve got there; take the directory for 1905, let’s see what Wixsons lived in Escanaba in 1905, if any. And … hang on … we’ve got a hit! Joseph T. Wixson was a photographer running the J.T. Wixson studio. But right below him in the directory listing there’s also a woman, another Wixson, but her name is Lillian. Now, she’s a photographer … but there’s no indication that her name is Julia as in Peter Palmquist’s database. Long story short, using the information that we found online in both newspapers.com and ancestry.com, and also drawing on some great research that was done by a man named David V. Tinder, who created a wonderful Directory of Early Michigan Photographers … putting all of those materials together we are able to piece together the outline of the story of the Wixson photographers in Escanaba, Michigan. I should note that I’ll put a link in the episode notes to this Directory of Early Michigan Photographers by David V. Tinder because it’s actually available for free online at the William L. Clements library at the University of Michigan. Gathering all this information together we discover that Joseph T. Wixson was a photographer in Michigan. Starting shortly after after the civil war, Joseph Wixson was a photographer in various places in Michigan right up until 1905. His second wife’s name was actually Julia Etta Van Camp — she’s the Julia E. Wixson that is in Peter Palmquist’s database. According to David Tinder’s directory, Julia E. Wixson ran the Wixson gallery in Grand Haven, Michigan in the early 1880s. Joseph T. Wixson was also a photographer but he had multiple branches, and Julia was running the Grand Haven, Michigan, branch while Joseph was off running galleries elsewhere. Their son, Chester Wixson, eventually becomes a photographer as well, and for a time he actually partners with his father and creates a gallery called Wixson and son. By 1905, though, Chester is married, and he and his family have moved away. And so, when Joseph Wixson actually becomes ill in 1905, his daughter Lillian, who is a photographer, she appears to have stepped in and helped out, if not outright taken over that gallery in Escanaba, Michigan. Lillian winds up getting married in 1906, though, and Joseph (who is very ill) and his wife, Julia, moved to Rhinelander, Wisconsin, where Joseph eventually dies in 1909. A lot of the information about what happened to that gallery, and Lillian, and Joseph getting ill and having to move, well all of that is in Joseph’s obituary that appears in the 1909 newspapers. I should note that neither Lillian nor Julia ever seem to do photography again after they leave Escanaba, Michigan. But it’s not really the end of the story that comes out of finding that Wixson cabinet card. Actually, the reason I wanted to do this special episode today as a tribute to Peter Palmquist’s prowess is that Chris and I are always astonished at how just matching one name from his database — really just that one glimpse of information — leads us to uncover often not just one woman who worked as an early photographer (like Julia Wixson) but two, as we have here with Julia and her daughter, Lillian … but even potentially more. And that’s actually the case here, too. Because, you see, the Wixson studio in Escanaba, after Joseph, Julia, and Lillian all left in 1906, well that studio was taken over by a man named Henry Robb. As it turned out, Henry Robb’s wife, Ida Mae, as well as their daughter, Alda, were also photographers. This is according to David Tinder’s personal communication in the 1970s with Alda, which is outlined in his research in that Directory of Early Michigan Photographers. It turns out that Ida Mae and Alda were effectively running the Robb studio in Escanaba in the 1910s all the way up until 1925, by which time they had built up quite a successful business. This is while Henry was off in Florida buying and running an orchard. But in 1925 tragedy strikes when ida Mae and Alda are both stricken with smallpox. They survive the big epidemic that sweeps Escanaba that year, but they’re forced to close their photography business and move to Florida where Henry is already located. There’s no indication that any of them ever did photography again. But if you’re keeping track, that one Wixson cabinet card that we found in a box in an antique store led to uncovering the stories of not one, not two, but four different early women photographers. Chris and I, as I said, used online resources to fill in some of the details, [using] those things that are now available to us online, including David Tinder’s directory. Interestingly, the directories that are available for Escanaba online include that 1905 directory that list Lillian Wixson as a photographer, but she’s not actually included in David Tinder’s directory, because he was focussed specifically on owners of galleries. Lillian definitely worked at her father’s gallery, and I believe that she definitely managed it when he got sick because from his obituary it’s clear he wasn’t working in 1905. But she’s never technically listed as the owner of the gallery, and that’s probably why she got left out of David Tinder’s directory. Another thing that’s not in the Tinder directory is that the Wixson gallery was advertising in Escanaba in a Swedish language newspaper in 1905-1906. That’s right when Joseph T. Wickson was sick. As I said, I think it’s likely in 1905 that Lillian, who was working in the studio according to the directory, could have been also running it. But, pf course, her mother, Julia Wickson, could also have been working there and running it, too. But what’s the connection with the Swedish language newspapers? Lillian, [her father] Joseph, and [her mother] Julia were all born in the United States. Neither Joseph nor Julia seem to have any connection through their ancestry to Sweden. So, that’s a mystery that still needs to be explored. But David Tinder does have some interesting information about the Wixsons, though. For example, Joseph turns out to have been married twice. Julia was his second wife. His first wife was named Sarah, and David Tinder came across something that indicated that Julia was a servant actually working for Joseph and his first wife, Sarah, while Sarah was pregnant. And it was shortly after that at Sarah winds up filing for divorce … and then Joseph and Julia get together. What I really want to point out is that starting with that one name on the one cabinet card led to four women photographers, and that was all thanks to Peter Palmquist, his research, and his database that had that entry for Mrs Julia E. Wixson. Remember, Peter Palmquist was doing all of this research before any of these online resources were available. [It is the availability of these online resource which makes it so much easier for Chris and I to discover more information about these women. Wherever Peter Palmquist found the notation for Julia E. Wixson, he didn’t run across Lillian Wixson, his database also doesn’t include Ida Mae and Alda Robb in Michigan, either. But again, he was doing all of this research manually. His home base was in California and getting information about early photographers in Michigan before all these online resources would have been extremely difficult. I can only imagine what he would have been able to do with everything we have now at our disposal, had he had it at his disposal, too! So today, it’s really an appreciation of the prowess of Peter Palmquist. 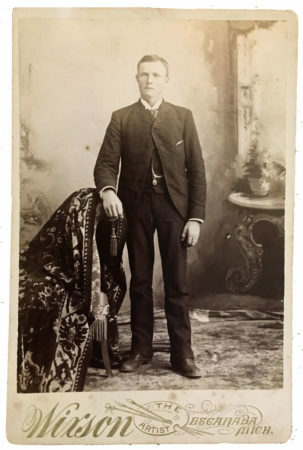 Photographs, Pistols & Parasols – [both the podcast] and this project in general owe so much to his legacy and having access to “Palmquist in our pocket” whenever we set off on the trail to discover examples of photos by early women artisan photographers. 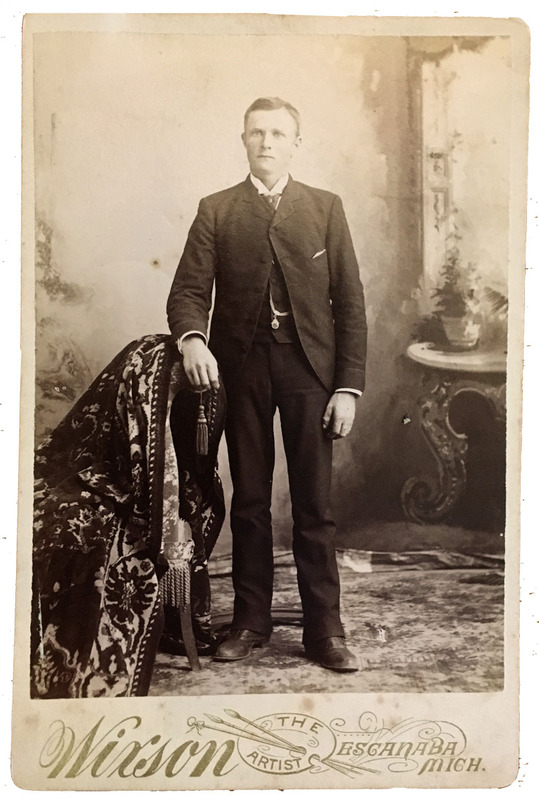 You’ll be able to see that Wixson cabinet card that started us off on our hunt today on my website at p3photographers “dot” net. If you have any questions or just want to drop me a line, send an email to podcast “at” p3photographers.net. And, of course, you can always follow this podcast on Facebook, at facebook.com/p3photographers. One final note: today’s episode is going to be the last one for Season 3. Oddly enough, when I started Season 3 last fall, I actually had planned out the entire series of episodes I’d wanted to do. But life has a way of taking a series of unexpected turns, and certainly over the last few months that’s true with both things in my life and also the episode plans, which have completely fallen by the wayside compared to what I had first thought I do. Some of the unexpected turns were fun, such as opportunities to talk about Photographs, Pistols & Parasols with different audiences. Some of the things that happened were more serious, though. For example, due to a death in my family, my plan to give a talk at the University of Kansas this Spring has had to be postponed. Also, I had plans to bring you interviews this season with a few other historians, but those plans have had to be pushed back as well. Anyway, rather than try to get Season 3 back on its original track, I’m just going to bring it to a close with today’s episode. May 1st will officially launch Season 4! Here’s looking forward to new beginnings all around! Until next time, I’m Lee McIntyre, and this is Photographs, Pistols & Parasols.